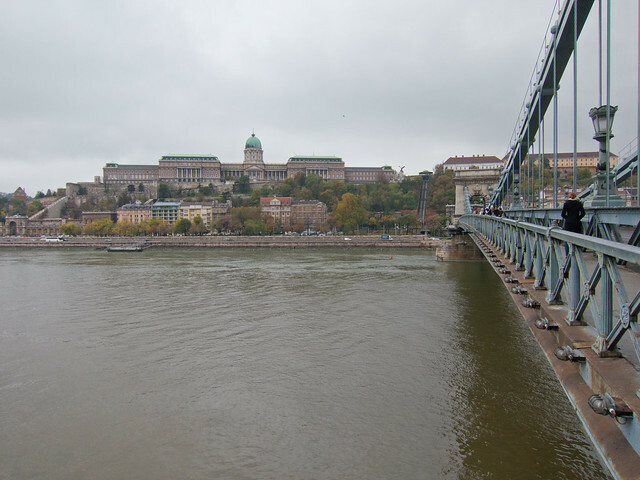 Budapest is one of those cities everyone seems to like, so as my Eastern European rail trip of 2012 continued, I caught a train from rainy Bratislava to the overcast Hungarian capital. 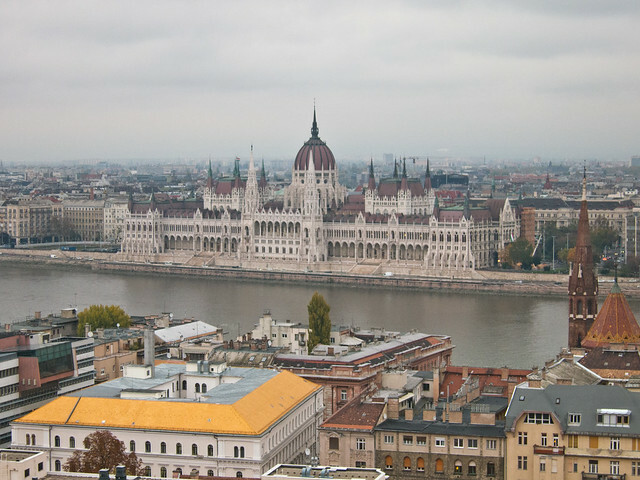 I budgeted four days to explore Budapest, which I'd soon come to find was not nearly enough. The city is filled with history, museums, intrigue and mineral-rich baths. If you're heading to Budapest, be sure to pack some travel insurance, such as the policies offered by Southern Cross Travel Insurance. They'll ensure you're protected in case of emergency. Here are my top 10 things to do in Budapest, based on the time of year I visited, and the the number of days I could afford it. 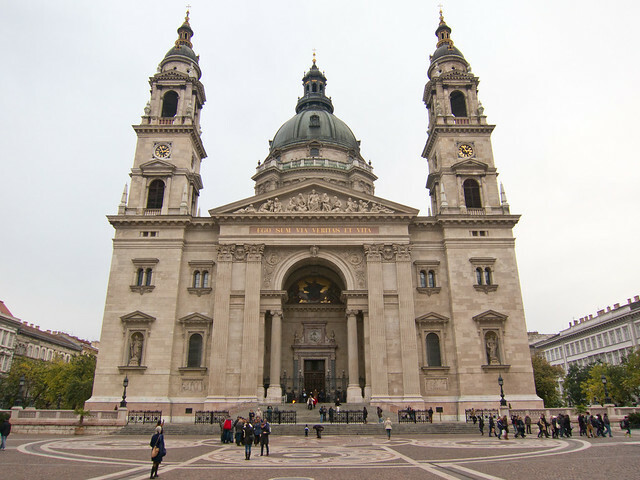 Inaugurated in 1906, St. Stephen's Basilica (also known as Budapest Cathedral), took more than 50 years to complete and can hold up to 8,500 people. The church takes its name from the first king of Hungary, whose mummified hand is maintained to this day in a glass case near the altar (something I was unaware of until after my visit). As much as I love gawking at beautiful interiors, I often hit up large cathedrals in order to enjoy panoramic city views. From April 1st to October 31st, there's an elevator available. During Winter, you'll need to climb the 364 stairs to reach the top. 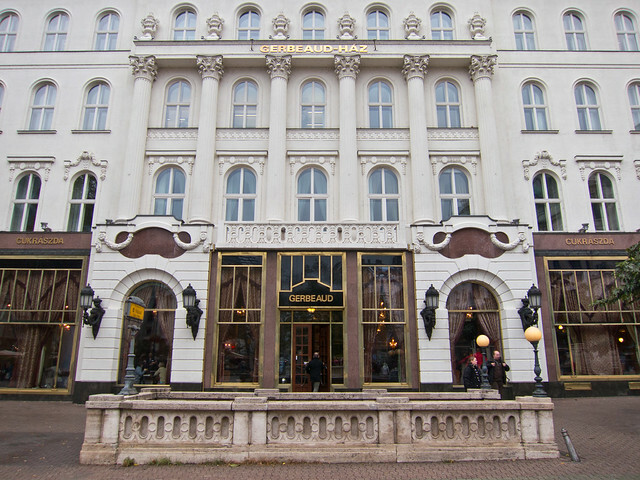 The cost of entry is 500 Hungarian Francs (HUF), or about $2.15. 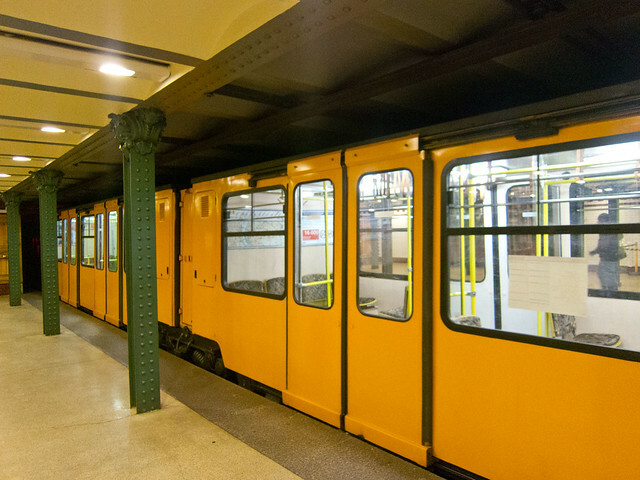 Speaking of Budapest's metro, it's the oldest electrified underground system on the European continent, having begun operation in 1896. Only London's metro is older, having opened in 1890. Line 1 is the original line, and was named a UNESCO World Heritage Site in 2002. Lines 2 and 3 were opened in the 1970s, and the latest, Line 4, began operation in 2014. Tickets are cheap, so give your feet a break and check it out as you make your way around the city. 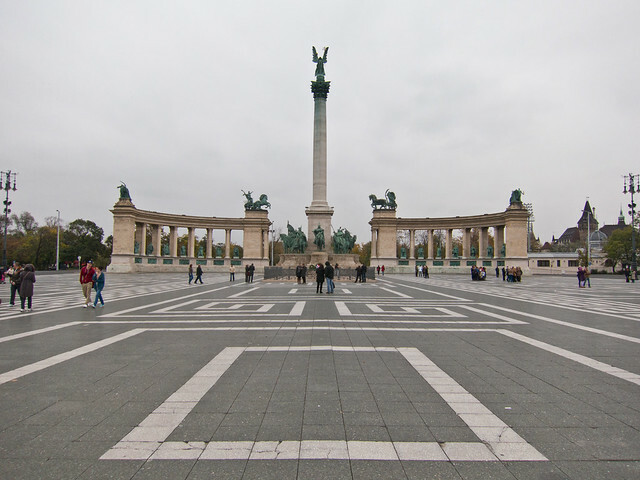 In addition to the metro, 1896 was the year Heroes' Square was created to mark the 1,000-year anniversary of Hungary. Staring at the monument in the middle of it, you'll have the Museum of Fine Arts to your left, and the Kunsthalle museum to your right. Behind the monument is City Park, home to the Széchenyi Baths, one of Europe's largest public baths. Given the time of year I was visiting, and the grey skies, taking a public bath wasn't high on my “to do” list, so I pivoted to the left, and headed for the Museum of Fine Arts. It just so happened the museum was hosting a major Cézanne exhibit, and impressionism is one of my favorite styles. But before I walked through the temporary exhibit, I covered the permanent collection, coming across some masterpieces like the earliest copy of The Garden of Earthly Delights by Hieronymus Bosch. Though heavily damaged, it was still fascinating to see up close. I'd previously seen the original in Madrid's Prado Museum during my 2007-2009 'round the world trip. Additional highlights included a colorful Madonna by Raphael, and works by Bruegel, Goya, Money and Rodin. Hours are Tuesday to Sunday, 10 a.m. to 5:30 p.m. Tickets to the permanent exhibits are 1,600 HUF, or about $6.90. Departing the Museum of Fine Arts into the darkness of my first Hungarian night, I looked at my phone and found I still had time to squeeze in a visit to a very different kind of museum. 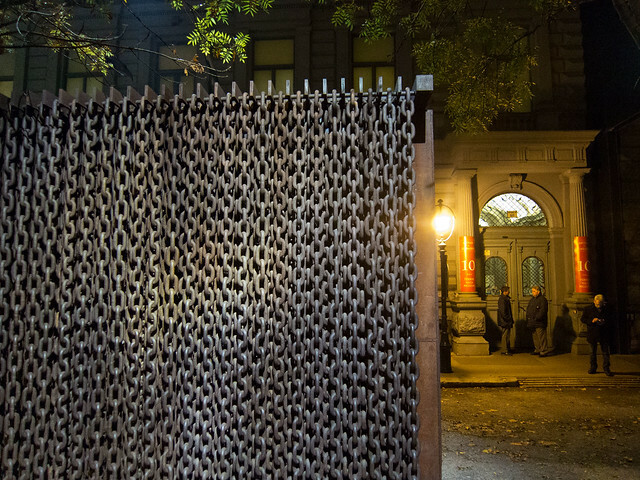 Housed in the same building used as the headquarters of the Nazi party in Hungary, the House of Terror Museum commemorates the victims of the Nazi and Communist Russian regimes in Hungary. I had no knowledge of Hungary's history during this time, therefore it was an eye-opening experience to walk through the exhibits and learn of how the Hungarians were terrorized by these two movements. When moving through the museum (which takes about one and a half hours), the final stop will be the basement, which was used as a prison. Hundreds, if not thousands of people were tortured there, and it's hard to pass through such a space without being affected. The House of Terror is open Tuesday to Sunday, from 10 a.m. to 6 p.m. The cost is 2,000 HUF, or $8.60. If you're going to stop for coffee anywhere in Budapest, make it Gerbeaud. Located centrally in the city, it is one of the capital's biggest and most historic cafés. 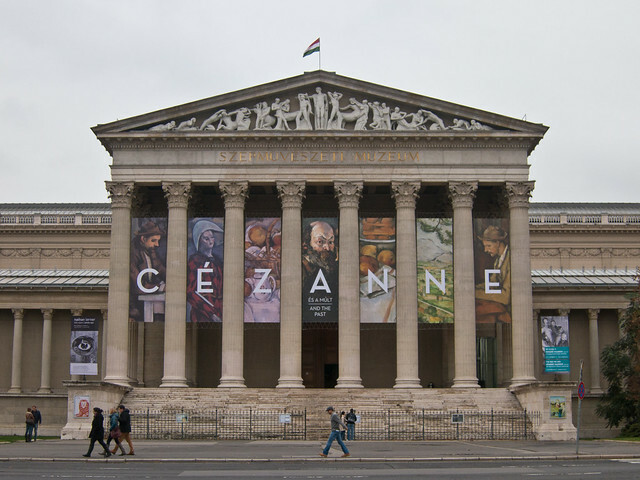 Opened in 1858, it was later expanded by the late Swiss owner by the same name when he bought it in 1884. Stepping inside is like stepping back in time. Chandeliers hang from the ceiling, and wood accents and drapes add elegance to the atmosphere. Gerbeaud is open daily from 9 a.m. to 11 p.m. Completed in 1849, Budapest's Chain Bridge was considered an engineering marvel at the time. It was the first bridge to cross the Danube River, thereby connecting Buda and Pest, which were initially two separate and distinct cities. Crossing the suspension bridge by foot is a popular tourist activity, and offers wonderful views all around. It only takes a few minutes, and there's a dedicated pedestrian walkway. On the Pest side, you'll almost immediately arrive at the funicular which can take you up Castle Hill. There's a lot to explore up there, so much so that it truly deserves a full day or more of your time. Beyond the ruins and architecture of Castle Hill, I wanted to see the former prison of Vlad Tepes (aka Vlad the Impaler, or Dracula). 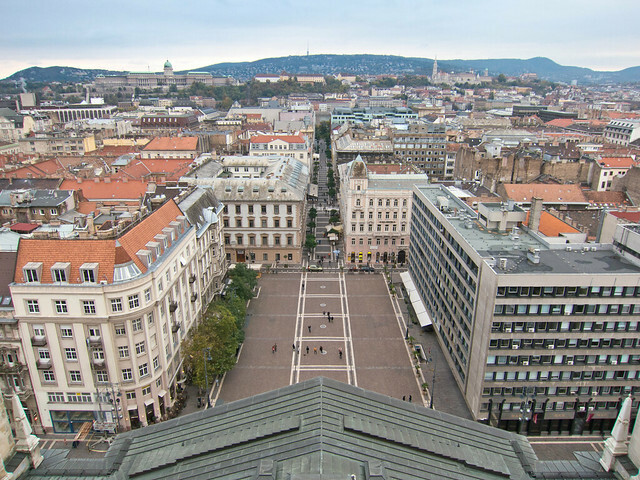 The Labyrinth of Buda Castle is a system of caves running beneath Castle Hill. The network is six miles long, though tourists are limited to walking only a mile of it. The decorations are cheesy at times, but you do get a feel for how dark and miserable it would've been to have been imprisoned down there, especially in the 15th century when the only light would've been from burning torches. 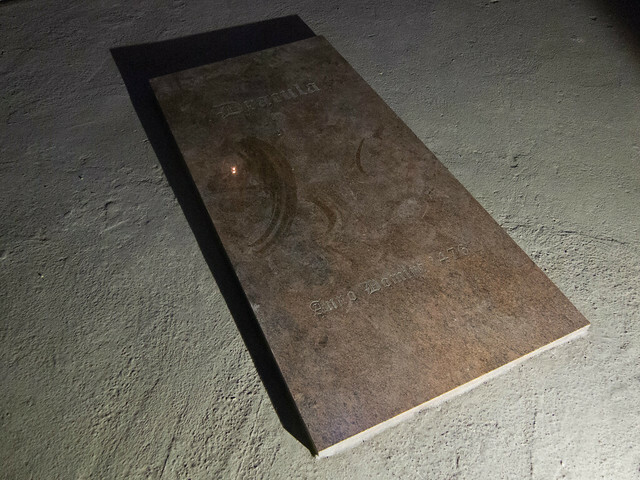 The Labyrinth is open daily from 10 a.m. to 7 p.m. and costs 2,000 HUF or $8.60. 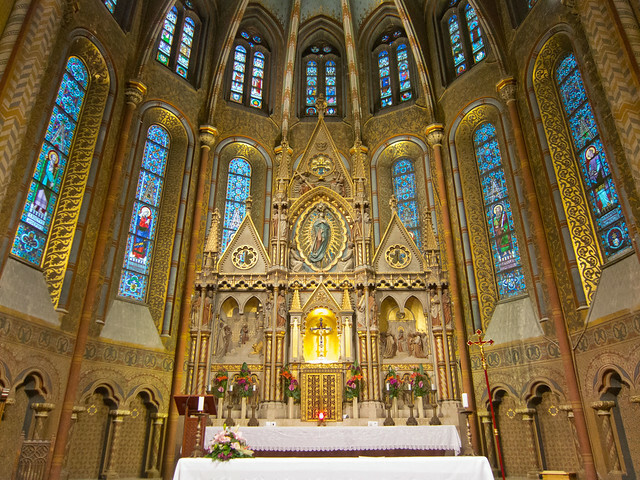 Upon emerging from the caves, I wandered over to the 700-year old Matthias Church, which takes its name from another former Hungarian king. 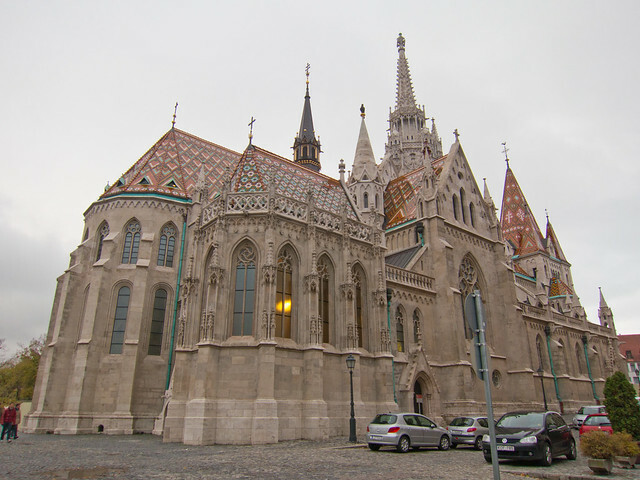 It's one of the oldest buildings in Budapest, and I was enamored with the restoration work. The exterior was immaculate, the tiled rooftop incredibly colorful. There's a small fee to enter, but it's worthwhile to see a golden altarpiece surrounded by fine stained glass. If I remember correctly, there was restoration work happening inside at the time of my visit. 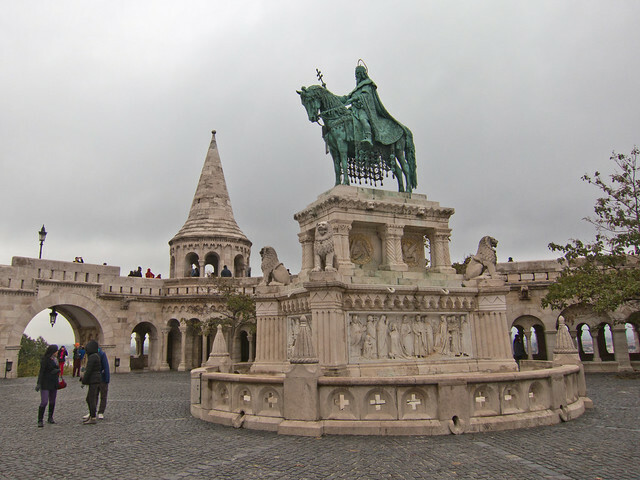 Behind Matthias Church is the Fishermen's Bastion. Though the structure is only 100 years old, this area was used as far back as medieval times by fisherman who protected this area of the city. The best reason to go for a walk through here is the commanding city views it offers. You'll see clear across the Danube into the rest of Budapest. From the Fishermen's Bastion, you'll have a direct view of Hungary's Neo-Gothic Parliament building, which is situated along the river. At just over 100 years old, construction was inaugurated on, yes, you guessed it, 1896. Featuring 691 rooms, it's the third largest parliamentary building in the world. The following morning, on the way to the train station, I stopped by the Parliament building for a closer look. A large section was under restoration, the result of air pollution waging a constant war against the typically white limestone. As I said from the start, four days was hardly enough to get a feel for Budapest. I missed so much, including the ruin pubs, the nightlife and the baths, not to mention more museums and historical points of interest. I hope to make it back in Spring some day to get the full, warm-weather experience. Have you been to Budapest? Share your favorite experience in the Comments below. Budapest, including the banks of the Danube, the Buda Castle Quarter and Andrássy Avenue became a World Heritage Site in 2002. This post was brought to you by Southern Cross Travel Insurance. I would’ve liked to explore the Ruin Pubs. It was more a matter of not having someone to go with then lack of time (though I was exhausted by the end of each day). huf = forint, not franc. citedela hike (not for fatties) would be # 11.
the baths are cool, kind of, but are def a tourist trap. “gellert” baths less of a trap than “szechenyi”. Hey Dave, hubs and I have a week long trip we are planning out for winter time. (Early December). Any suggestions for winter visits? The Hungarian history museum was very interesting. Try the fruit soup! It’s amazing. it’s been ages since I was in Budapest but I remember seeing many of these places. I’d love to go back. I bet it’s great in the winter too! Love your work! Budapest is wonderful. The most spectacular place to visit is statue park (short drive out of main city). It shows (outdoors, due to their sheer size) a huge number of communist statues removed from the city. These statues are up to 10m tall and are spectacular. There is also a museum on site with incredible movies and artifacts from Hungary’s journey to freedom. Hi ! Nice article ! But the Labyrinth of Buda Castle is permanently closed according to their website. Let’s replace it with a bath afternoon at Szechenyi ! Great post! I love Budapest the city has such a fantastic atmosphere. Fantastic write up. Most definitely sold me on the idea of visiting. We were staying in a hotel just opposite from Parliament. Those were one of the nicest views I ever saw during the night! Great post. You should also see the Hospital in the Rock.